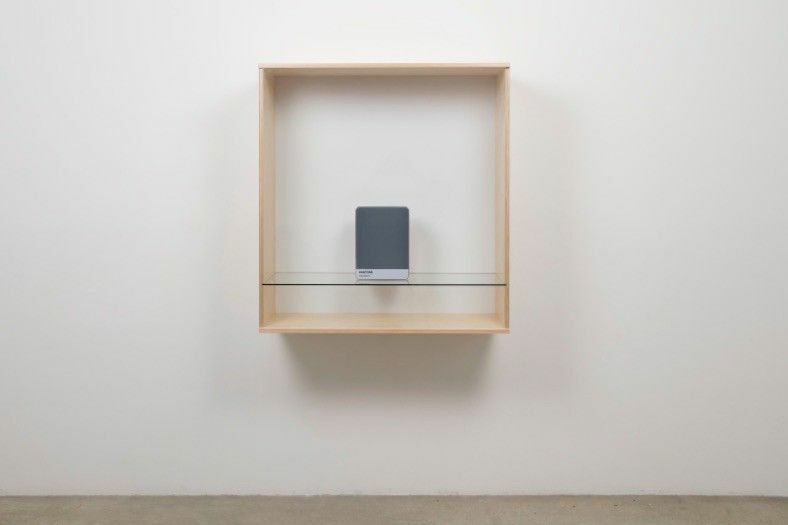 Haim Steinbach, 'Untitled (Pantone Cool Gray 10)', 2016, Baltic birch plywood, plastic laminate and glass box, with metal Pantone storage box, 41 3/8 × 39 3/8 × 17 1/2 in. (105.09 × 100.01 × 44.45 cm). Join us at ISCP on Tuesday, May 8 at 6:30 for Brooklyn Commons: Haim Steinbach and Remy Jungerman. Steinbach and Jungerman will consider the recontextualization of existing objects, and the cultural meanings of display. Throughout his career, Haim Steinbach (born 1944, Rehovot, Israel) has exhibited his work consistently at major museums worldwide. In 2013, the Hessel Museum of Art at Bard College in New York presented an important solo exhibition of the artist’s work since the early 1970s, entitled once again the world is flat, which traveled to Kunsthalle Zurich and Serpentine Gallery, London. Other notable solo presentations include The Menil Collection, Houston, 2014; Statens Museum fur Kunst, Copenhagen, 2013–14; and the Berkeley Art Museum and Pacific Film Archive, 2005. In 1999, his work was presented at the 47th Venice Biennale curated by Germano Celant. The artist’s work is in the permanent collections of the Museum of Modern Art, New York; Metropolitan Museum of Art, New York; Tate Modern, London; Guggenheim Museum, New York; Stedelijk Museum, Amsterdam; Israel Museum, Jerusalem; Museum Moderner Kunst, Vienna; and the Museum of Contemporary Art, Chicago. Remy Jungerman (born 1959, Suriname) has lived in Amsterdam since 1990. His recent work is entangled with his Surinamese roots and relates to global citizenship. He has exhibited works at Prospect.3, New Orleans; Brooklyn Museum; Rennie Collection at Wing Sang, Vancouver; Stedelijk Museum, Amsterdam; Gemeente Museum, Den Haag; Centraal Museum, Utrecht; Havana Biennale; Museum Bamako, Mali; Badischer Kunstverein, Karlsruhe; the Museo de Arte Latinoamericano de Buenos Aires (MALBA); and Cemeti Art House, Yogyakarta. This year’s series also includes talks between Ulrike Müller and Taloi Havini, and Suzanne McClelland and Sonia Louise Davis.